If you are new to Investing in Mutual Funds, then this article is for you. I will help you to learn the basics of Mutual Funds and help you to start investing in mutual funds. 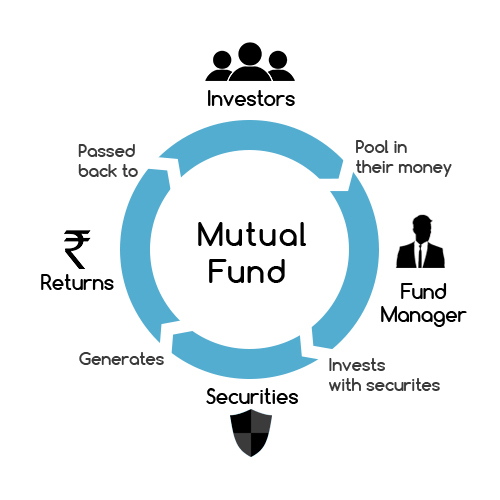 Mutual Funds can be defined as an investment vehicle which will collect money from a large number of people (or investors) and invest in securities such as stocks, bonds, money market instruments and other assets. The money collecting company can be called as Asset Management Company (AMC) and the person who manages this money is known as Fund Manager who will be appointed by the AMC. AMC charges a certain fee from investors for managing their money which is known as Expense Ratio. Investors can choose to invest in any fund managed by an AMC. Investors by paying the fee (Expense Ratio), can enjoy the appreciation of capital and dividend payment even they are not acquainted with stocks or bonds. This is how mutual funds work. Mutual funds can be classified as Equity-Based Mutual Funds and Debt Based Mutual Funds. Any fund type comes under these 2 main categories. Equity-based Mutual Funds usually invest in stocks and Debt based mutual funds invest in government bonds and corporate bonds. You can further read more about types of mutual funds in my upcoming posts. Now you came to know that there are 2 types of funds. One is Equity Funds and another is Debt Funds. If you are looking to invest stocks, but due to lack of expertise to chose the stocks to invest directly, you can opt to invest in equity-based funds. If you are not sure about which type to choose, then you need of investment could decide your investment fund. If you are investing in longer-term goals like children education, marriage or your retirement fund, then choose equity-based funds. If you are looking for short-term goals like buying a car or a downpayment for a home loan, then choose the debt funds. We all know equities is a risky asset class which also an asset class which has provided highest returns in the past. The answer to this question how long you should invest to make most of it is at least 5 years tenure. If you could invest for 10 years, it is the best option. As per the valueresearchonline.com data, When we look at BSE Sensex returns in last 20 years, the best five-year rolling returns in this span is 47.2% and the worst 5-year CAGR is a negative 7.9%. If you held for 10 years, the best rolling return was 26.3% and the worst one a negative 2.5%. To invest in Mutual Funds, you should pay a certain fee which is called as Expense Ratio. Do check the expense ratio to get a clear picture of what your real returns would be after deducting expense ratio. Suppose, Fund ‘A’ is generating 26% returns with an expense ratio of 2.85%, the real returns will be 25.259 and Fund ‘B’ is also generating 26% returns with an expense ratio of 1.09%, the real return will be 25.716% which is almost 0.5% difference in final returns. So, when you are struct between two funds with the same kind of expected returns, go for a fund with less expense ratio. Once you select a fund or funds of your choice, you can choose to invest either offline or online mode. Offline mode of investing needs you to contact the empaneled distributor and provide KYC Documents, fill up the application, provide a cheque for the desired investment amount. AMC will allocate the units. Online mode of investing so simple than the offline mode. You can just signup for websites like Fundsindia.com or any other mutual fund platform to invest. Then fill up the online application and pay the amount using your debit card or net banking facility. This way you can invest without waiting for any manual process. Online buying of Mutual Funds is done under a single sign-on and completely paperless investing process. Online platforms allow lump sum investment, SIP investment, the redemption of units, making switches between different funds. All can be done online. Lump sum or SIP (Systemative Investment Plan)? You can invest in mutual funds in 2 way. One is the lump sum amount and another is SIP mode. If you want to invest the whole amount in one go, you can choose to invest in one go and forget about it. If you have monthly savings which you want to invest every month, then you can choose SIP mode of investment. In SIP, you opt to invest a particular amount every month which is fixed throughout the tenure. SIP is the best way to invest in mutual funds. In case of Lump sum investments, you need to time your investment, which is almost impossible to predict. Hence, converting lump sum investment into a SIP is the best way to average the cost of investing. How long the current fund manager is working with this fund. If he is new, look for his past record of funds he managed before joining this AMC. Is it satisfactory? Also look for frequency of fund manager changes in the fund that you opt to invest. If the fund manager is changing too often, it is better to avoid that fund. NAV: Mutual Funds value is calculated with NAV (Net Asset Value). The appreciation of NAV comes from the appreciation of stock holdings by the particular fund. Hence it is best to look at the companies the fund is investing in if you are good at. Exit Load: This is nothing but the amount that is charged if you sell the units of a fund before the stipulated time. Mutual Funds are regulated by SEBI. Mutual Funds also offer Tax saver funds. If you invest in those funds, you can claim the tax deduction. Past performance does not guarantee the future returns. So, don’t follow past returns blindly. We will focus on specific funds to invest in our upcoming posts. It is best to choose the 5 star rated funds by valueresearchonline.com., which is authentic than any other source. Assets Under Management (AUM) as on March 31, 2018 stood at ₹ 21.36 lakh crore. The AUM of the Indian MF Industry has grown from ₹ 5.05 trillion as on 31st March 2008 to ₹21.36 trillion as on 31st March 2018, more than four fold increase in a span of 10 years! !